This week we’re heading (again) down the snicket between Heworth Green and Layerthorpe, by the side of what’s left of the gasworks site. 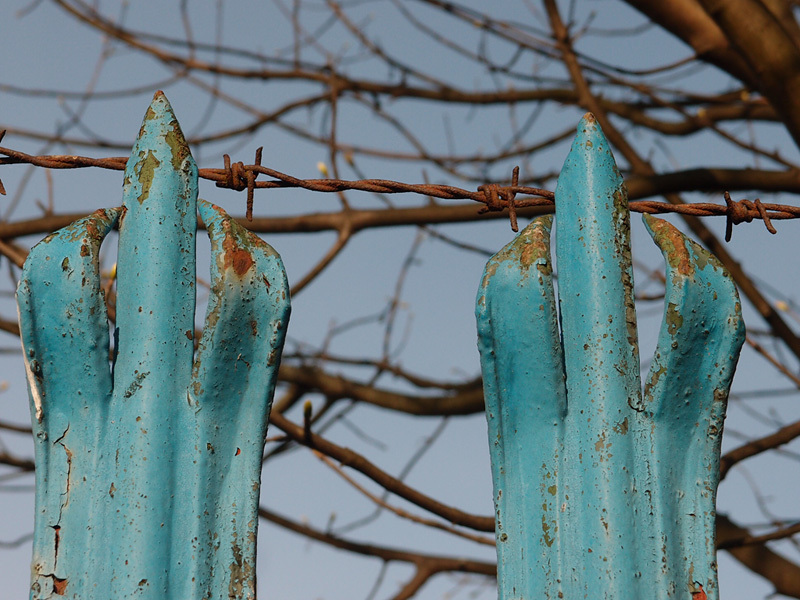 Its boundary is still marked with now rather rusty railings, painted with a colour I’ve heard referred to as ‘gas board blue’. This old snicket was at one time known as Fawdington’s Lane, apparently, a name which probably meant something to the people in the area, as the old names usually did. I’m not sure but I guess that the ‘Eboracum’ bit is connected to the naming of the buildings in the new residential development between this road and the Foss, which I mocked rather rudely some years back in a page titled ‘Selling York’. There’s a large office block here, on the part of the old gasworks site redeveloped some years back. It reflects what’s left of the gasworks, and this red brick building in particular, which I’ve been told is the old gasworks social club. 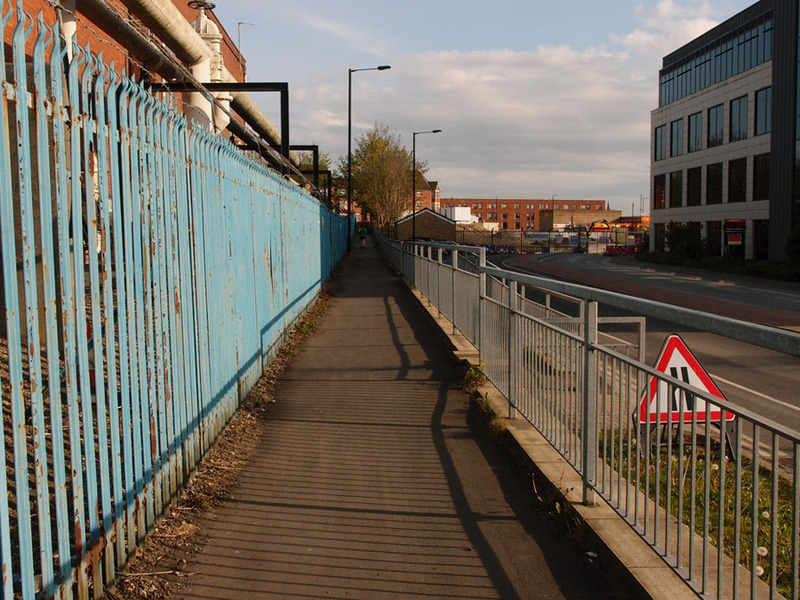 Eboracum Way passes this office block and then ends abruptly — basically a road to nowhere. It has been that way for years. 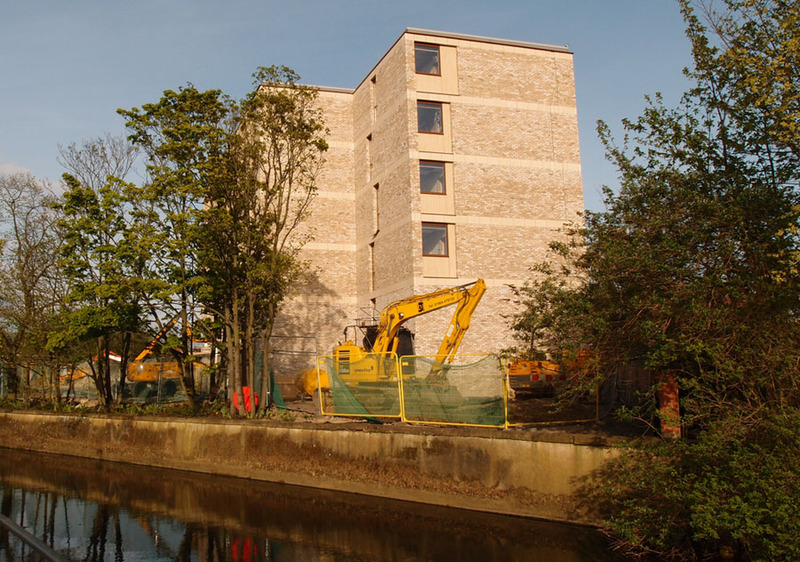 But in recent weeks the other half of it has been under construction, while for many months before that, as briefly mentioned on a previous page, a building has risen up to one side of this site, near the Foss. 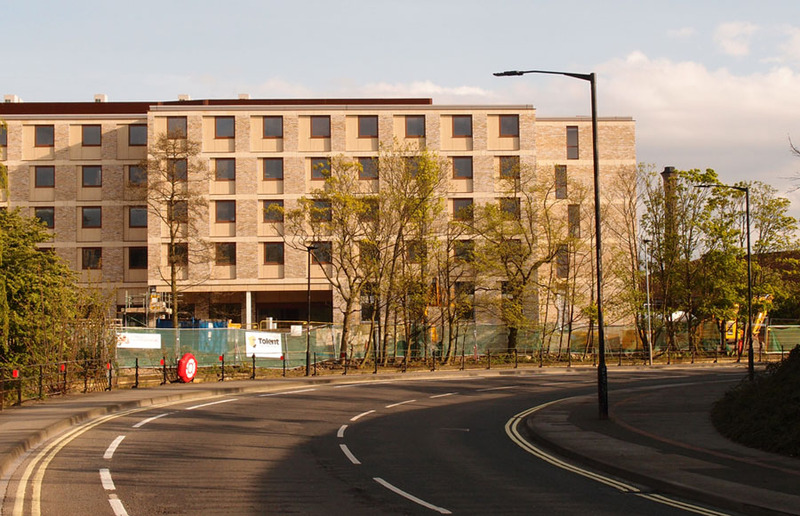 It’s a new hotel, a Travelodge, pictured here on the right as we look across towards Layerthorpe. That Foss Islands chimney so prominent on last week’s page is again a landmark on this photo. From the photos on these pages of mine you might get the impression that it’s always sunny in York. Not the case, of course, but I’ve always tried to capture my images of this place on bright days. And the same on this walk, the target of which is this rather controversial new hotel building. It seemed even more important in this case to get good sunlight on the thing, to show it to its best advantage, to see if we can find any merit in it, as the comments I’ve seen online suggest most people really aren’t impressed. The Minster looks a bit shocked. The hotel site is part of what was once a very large gasworks, occupying land on both sides of the Foss. 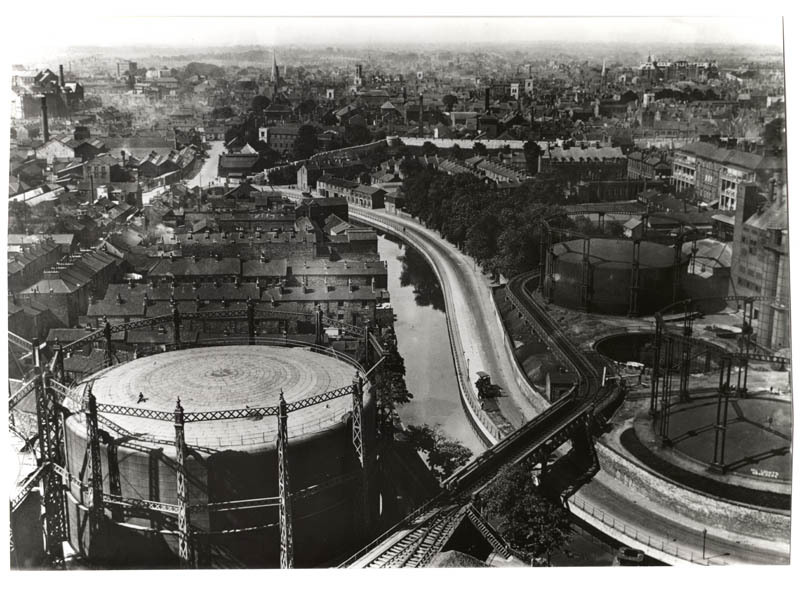 I’ve written a few pages about the gasworks. Part of a gasometer perhaps? Or part of the gasworks railway? Rather handsome, isn’t it. 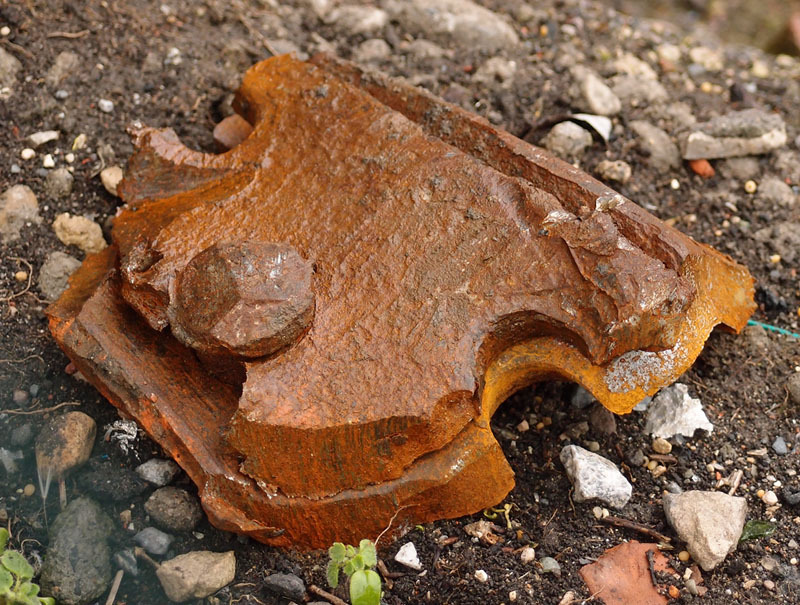 I have several photos of the lumps of rusty iron the site clearance revealed, and may share some more with you, dear readers, at a later date. I bet you can’t wait. 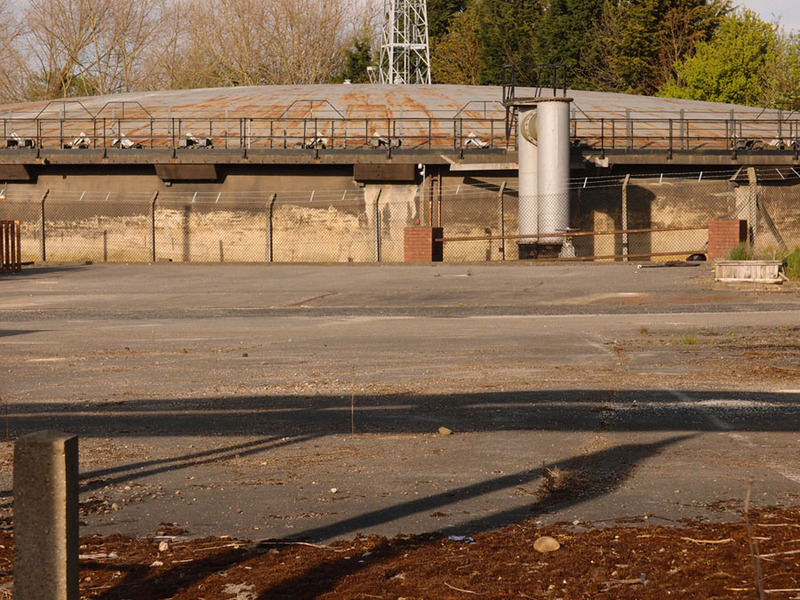 Development of the hotel site was held up by this gasometer, according to the report prepared for the meeting at which the hotel planning application was decided, back in 2014 (PDF on this link). An application was also made in 2004 for 158 residential apartments at the site (with basement parking). 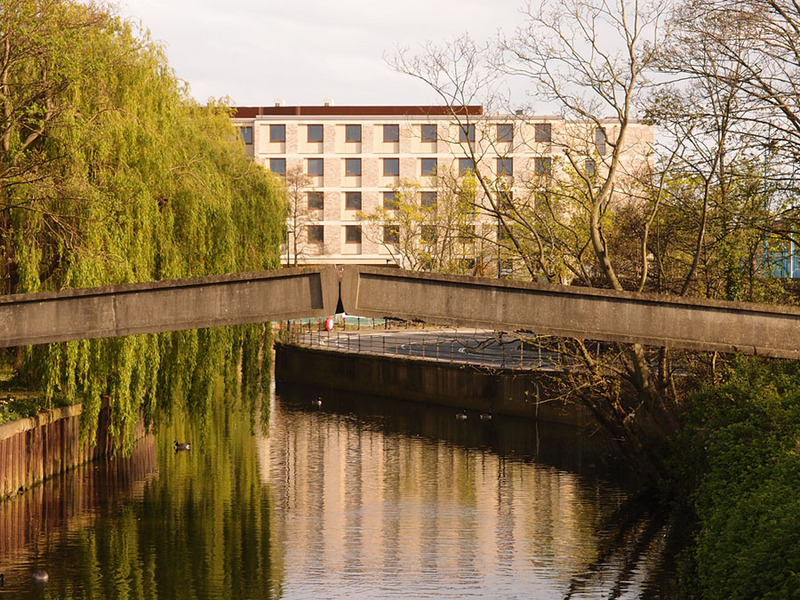 The scheme was approved by members, subject to a legal agreement to deliver affordable housing, offsite open space provision, a bond for remediation of contaminated land, a contribution toward a car club and access arrangements to a riverside walkway. The legal agreement was not signed and the application withdrawn as the scheme was not financially viable. Planning permission was granted for the same type and amount of development in June 2012 (application 11/02210/FULM). 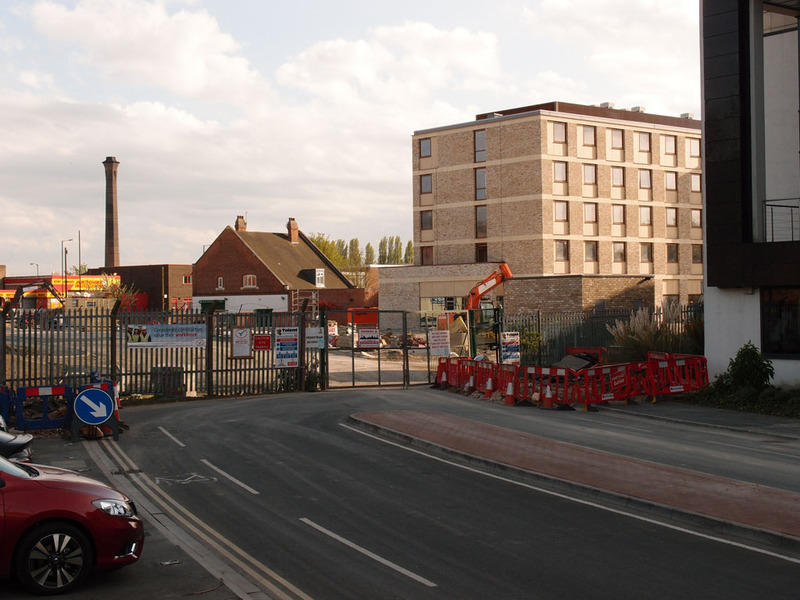 It has not been possible to implement the previous permission as the hotel aspect could not go ahead until the gasholder, which is to the northeast, is de-commissioned. This was a requirement from the Health and Safety Executive due to the scale of the hotel and its proximity to the gasholder. The gasholder is yet to be de-commissioned, therefore applicants have come forward with an alternative scheme which moves the building further from the gasholder to the extent that the HSE requirement would no longer apply. So there it sits now, the new hotel, almost finished, on its site by the Foss where the old gasometers used to be. The other sides are full of windows. This side, facing the city centre, has very few, and those that are there look like windows on corridors. Standing here looking at it, then turning round and facing the other way, I could see the Minster. Why was the building designed to face the other way? It might be, of course, that the Sainsbury’s on Foss Bank and the large former hospital building behind it block out views of the Minster from the new erection, hard to tell from down at street level, but surely something of the city’s handsomeness could be glimpsed from windows facing that way? So why is the whole thing orientated the other way, turning its back on the charms of the city it’s wanting to make a profit from? Perhaps the most interesting aspect of this development, at least from my point of view, is a new access to the Foss riverside. A riverside walk, following on from a section of riverside that already has benches and a path. So I’m not sure how and when it’s going to be opened up to the public. A revisit may be a good idea when the new road is open, and when the new riverside walk is accessible. 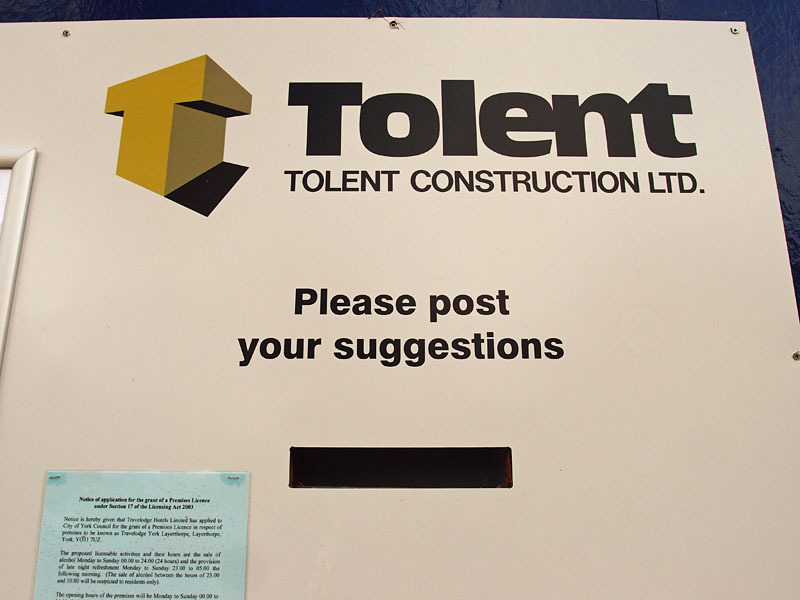 Not sure what kind of suggestions they’re hoping for, and it would be interesting to know if they’ve had any. Meanwhile, your views on this new addition to the skyline are welcome here via the comments form below. Following a request from a reader I’ve marked the location of this week’s wander on a Google map: see this link. I’ve been writing about York, and taking photos of York, and freely sharing it all online for many years now. Some of those earlier pages I’ve linked to above — for example this one from 2007 — have really small photos, because that was appropriate in those ancient days when most of us didn’t have broadband. That’s how long I’ve been doing this. As I now have my own archive going back more than a decade, and as I now have more of an understanding of how it all works, these plans and changes, it seems a good idea to keep producing these pages. On the other hand it’s working for free, and that can sometimes be hard to justify. So if you’d like to express your appreciation and power more pages, here’s a way to do that, with my groovy new ‘buy me a coffee’ button. Thanks to the supporters who powered this week’s page. The Fawdington’s ran the Woodman Inn and had a timber yard alongside the snickle that joined the Scarborough Road to Vicar’s Row off Layerthorpe. I imagine it was named after them. Anne Fawdington is listed there as early as the 1840s. Her son Thomas (-1880) became a successful glass painter and moved to a nice house in Fulford in the 1860s. How well I remember Fawdington’s Lane I used that route 2 to 4 times a day going from Hallfield road to Park Grove school. The route was Vicar’s Row over the gas works railway line Fawdington’s lane to Heworth Green the big Gas Works tank on the right painted in camouflage colors. Thanks Lisa. 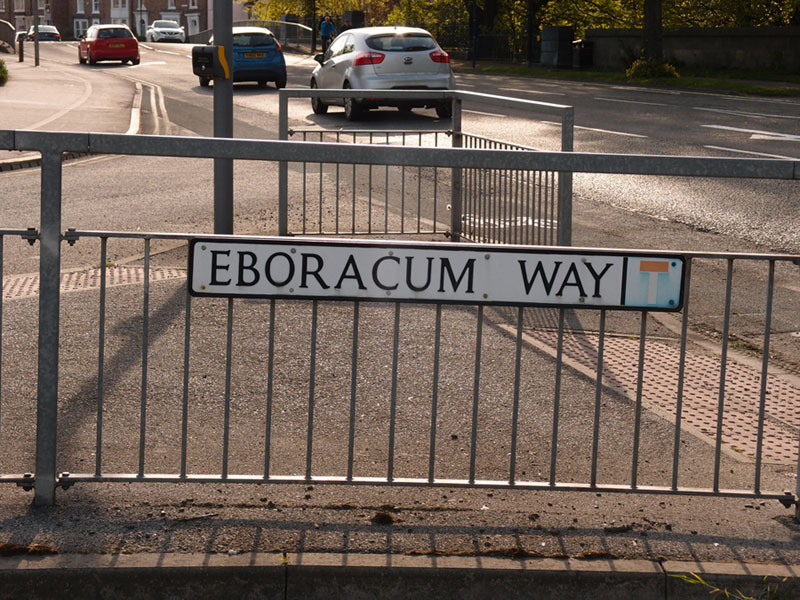 I live in the buildings on Eboracum Way. Have ever since they were built almost 10 years ago now. The gas works still make a terrible sound although the gasometer no longer rises and falls like it did when I first moved in. I face the old gasworks site, and that’s all I can see. A big open derelict and ugly space. The road has since opened up and it is terrible, speeding cars and traffic no long make it a family safe place. Which my block is mainly housing. I dread to think what it will be like when the other half is built on! The noise in summer of drunken idiots at daft o’clock in the morning arguing or just been drunken messes is a 4 nightly+ occurrence a week. Ever since they opened the road I’ve hated living here. The private land at the back, the riverside walkway that you mentioned is private land and it forms part of our communal gardens. You can understand been so close to town and quite away from public view, been just over the road from the groves the amount of money we pay to reside here in ‘private’ we don’t want to attract the attention or allow drunken idiots to sit in a nice area for our children to become a hot spot for the drunken and the city’s down and outs, which happens a lot in the groves. The gather in droves around any park bench, partially clothed, shouting and been loud with all sorts of foul language, drugs and alcohol. We don’t want that here. 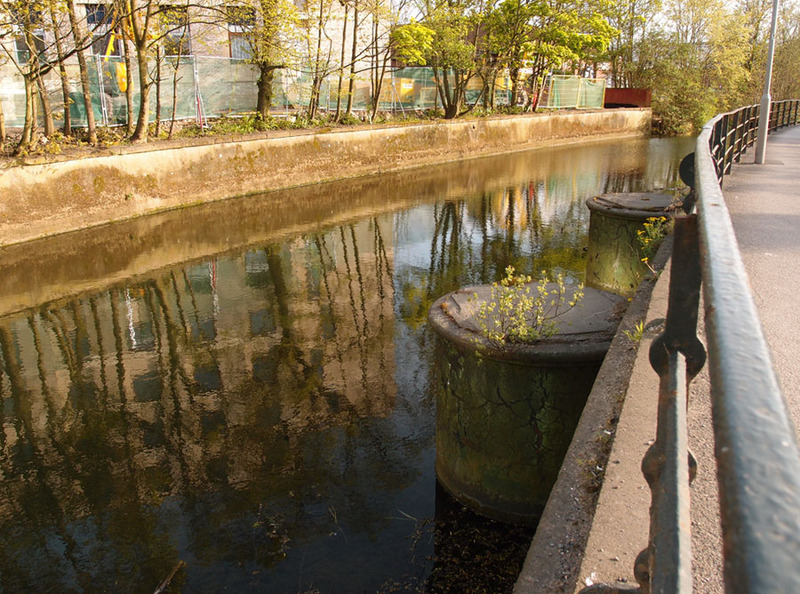 We pay a premium to have such amenities and so close to the city centre. 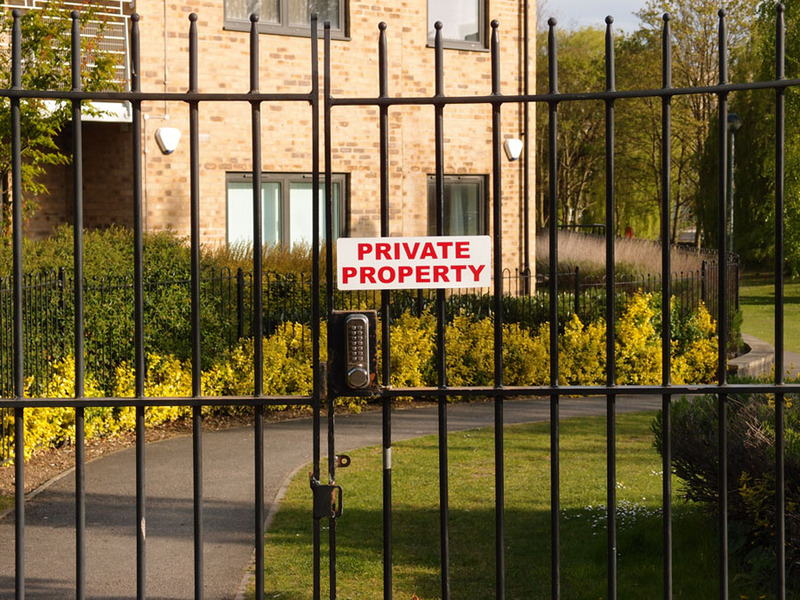 It’s no different to any other gated community or property with grounds. Great pictures though! I always wondered what those big structures were for in the river and the little bridge that has pipes running over it where for! Going to look at your other articles you’ve linked up. Very interesting thanks! Unfortunately, developers find it cheaper to develop greenfield sites rather than bring brownfield sites into residential use, maybe you should contact the government and suggest they give tax breaks etc to encourage redevelopment on brown sites so sites like this aren’t left to waste for years. This is made worse by the contaminates which lie in this land. It took many years for the site you are living on to be redeveloped from old gas land via a car park to housing and commercial use. Unfortunately anyone living in the town centre is likely to suffer from drunken yobs because of the countries inability to curtail this behaviour. The anti social behaviour needs to be resolved with the help of the council and police? Green spaces should be for all to use and people should not be fearful of the behaviour of a few. One of the agreements of planning for your building was that the builder would provide a through road from James Street to Heworth Green because with the additional traffic from the workers, house holders and tourists the existing roads wouldn’t cope. Hope the site gets developed soon. Whilst the site maybe empty, think yourself lucky you didn’t live next to the gas site when it was producing town gas and all the poisons that created. This has been a real interesting read and I am really enjoying your site. I have been looking at the old red brick building for a while now and was hoping to contact someone so I may enquire about using it. This is how I stumbled upon your site. Would you by chance, know who to get in touch with regarding the building/land ? I have helped run a boxing club in York for the last 10 years or so and we recently lost our premises. The old social club has been empty for as long as I can remember and would be perfect for what we need. Thank you for a great article. Kind Regards. Hi Thomas, that’s an interesting question about the former gasworks social club (as I was told it was) and the current ownership, and who to ask. 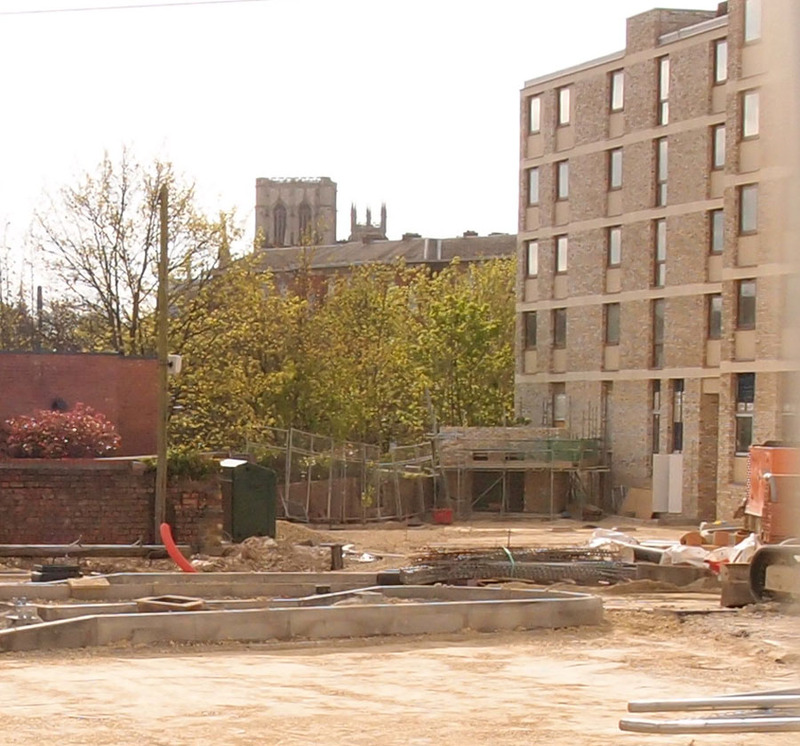 The last I heard the whole site was to be redeveloped, but I can’t see anything relevant and recent on https://planningaccess.york.gov.uk. The local councillors for that ward should have more information on that building/site and its current ownership and perhaps could help with your request. Apparently it’s in Guildhall Ward, see this link: https://www.york.gov.uk/GuildhallWard, the 3 ward councillors are listed below and the links take you to the relevant contact details. Though I can’t really see this building being made more open to public access/recreational/business use, because of the site it’s on. But worth asking. Let us know how you get on. 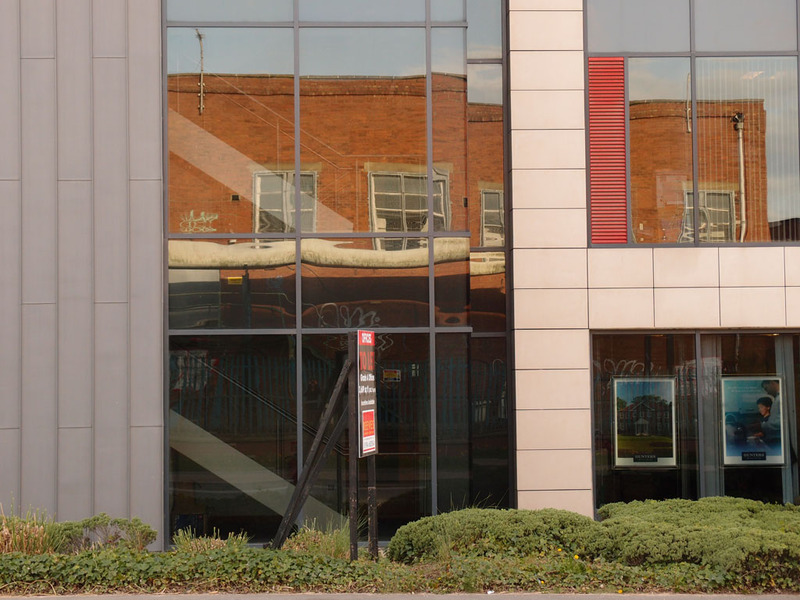 Where about’s is this red building?. Hi Trev, I think Thomas is referring to the old gasworks social club building, shown (as a reflection in the office block opposite) in the 4th photo – am looking into his interesting question. Thanks for the links Lisa that’s great. I’ll take a look at those over the next week and maybe make some phone calls. Yes, I understand that the site would probably not be suitable to open to the public. However, the reason that building itself caught my eye is it has direct access from the old snicket via a gate. York itself has changed very much in recent years. With lots of old buildings being demolished and made way for new housing and the souring price of the newer structures. This has made it increasingly difficult for people such as myself to run community projects so I’m happy to try any lead I can. Thanks so much for your swift reply Lisa! I believe that National Grid owned the land at one point unless they have sold it prior to the building which is planned for the site. If it is still owned by National Grid tel 020 7544 2000 and ask for the properties department. I did see a sold sign go up and a new name. If you have a look on Heworth Green near the big blue gates there may still be a sign on there.